These days, data security is becoming more and more important for many organizations and service providers. Data security is required to protect the customer’s privacy and the confidentiality of their businesses. Encryption technologies provide the highest data security level. Encryption is a process that inverts the sensitive source information (plain data) to a pseudo-random series (encrypted data) before transmitting it to the target. This pseudo-random series is completely meaningless for all parties that don’t share the common secret (encryption keys), while those who do can use it to decrypt the data back to meaningful information. Due to the growing demand to enhance information security over the PTP wireless link, Airlinx implemented the solution of adding another layer of protection against eavesdropping on the wireless signal and unauthorized access to the rooftop. Our proprietary solution is known as EncryptAir, which is a system that enables the highest level of information security over the wireless medium, without degrading link performance. The unique EncryptAir solution was integrated in our FibeAir family of products, introducing the first carrier class encrypted PTP wireless link. 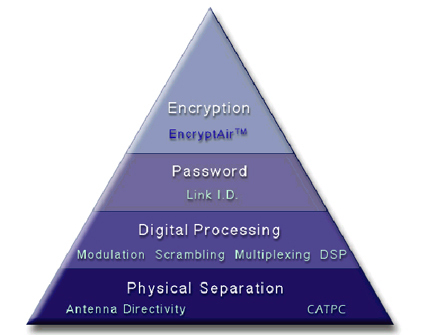 The following figure describes the four layers of data protection included in a FibeAir system. Wireless connections are more complex to encrypt then wire-line. The need to overcome BER and fades in the radio channel, while maintaining the radio system performance, requires special handling. The following figure shows a FibeAir encrypted link. The plain data passing through the FibeAir IDU is encrypted and transmitted to the ODU. The encrypted data protects the information flowing to the rooftop against potential eavesdroppers. EncryptAir, the robust encryption mechanism, employs the DES algorithm, which is more suitable for wireless medium, while maintaining the field-proven FibeAir system quality performance. The encryption algorithm and protocols were designed to overcome BER and fades, enabling smooth operation over the wireless channel.